This summer I am attending five weddings. In preparation for all these weekends full of fun, I thought it would be nice to pull together a list of items that are essential for summer weddings. 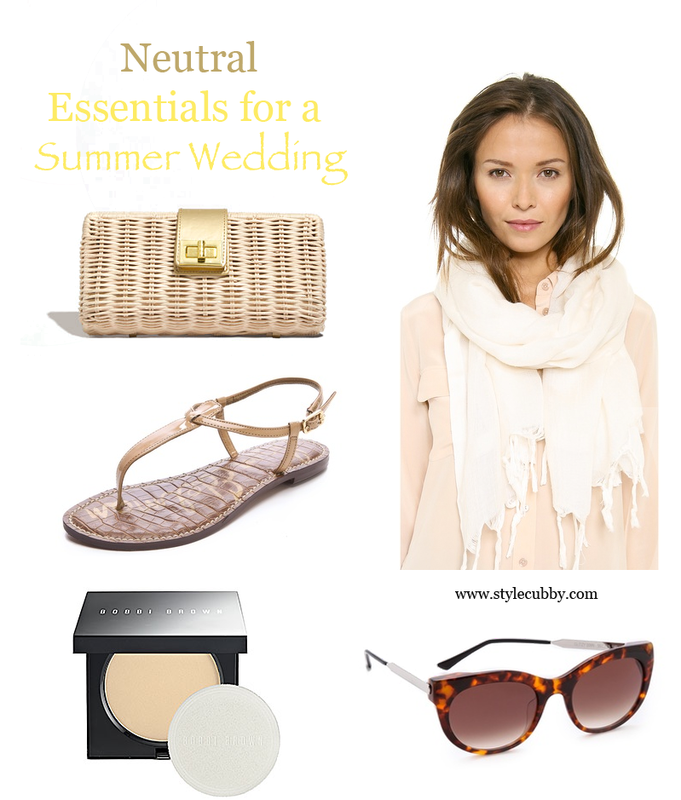 I plan to wear different dresses to each wedding but my essentials won't differ so I pulled together all neutral items that I could use for all five events. Check out my must-have's below! Clutch - When attending a wedding you don't need to bring much with you since most of your time will be spent enjoying the moment, so a clutch is a perfect option. This J. Crew clutch is just big enough to hold your phone, lipgloss, ID/credit cards, and some cash, which is really all you need. Sandals - I always make sure to bring a pair of flat sandals with me to any dressy event knowing my feet may need a break. After wearing heels for the ceremony, I often want to change into something more comfortable for the reception, especially if there will be dancing. These Sam Edleman sandals are neutral so they will match any outfit and I know from experience these sandals have a padded sole which makes them extra comfortable. Wrap - It's always nice to have something to wrap around your shoulders after the sun sets. I find Pashmina's have the perfect weight to keep me warm enough in between my rounds on the dance floor. I bring along a neutral one so I don't have to worry about matching it to my dress. Sunglasses - In the summer there is a good chance that at least one aspect of the wedding will be outdoors. Make sure you bring along a pair of sunnies to ensure you can see what's going on without squinting to much. Personally I am always drawn to tortoise shell sunglasses, to me, they are the ultimate neutral since they incorporate both black and brown. Powder - I don't know about you but my favorite part of a wedding is the dance floor, which ultimately means I will be sweating. Keeping a translucent powder in my clutch will help with oil control and make sure my face isn't shinny in photos. What are your wedding essentials? I think the throw is so important for a summer wedding - just never know when the temps will drop! I love the clutch!